"The Stars My Destination," second in my five-book formal tour of the history of science fiction, is a work of extremes, which makes it hard to say anything balanced about it. What it does well, it does very well. The rest is flat pulp, the equivalent of an off-brand cola. But since Bester doesn't dawdle, the flat bits never last very long -- none of it lasts very long -- and so pushing through does not require a Herculean effort, as with some modern writers. 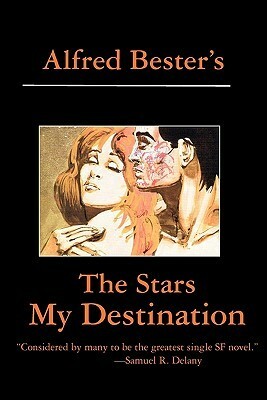 In exactly that way, "The Stars My Destination" was a homework assignment for me. I chose it specifically because it was billed as part of the sci-fi canon, where the whole point of my little self-directed course is the application of lessons to my own craft. Sadly, all the lessons of "The Stars My Destination" are ones I already learned by writing FANTASMAGORIA, to which many of the same criticisms apply. However, reading the one did improve my love for the other. If something like "The Stars My Destination" can be considered canon of the genre, the holiest of the holy, then surely my own book, with all the same warts, is something to be proud of. Sign into Goodreads to see if any of your friends have read The Stars My Destination.